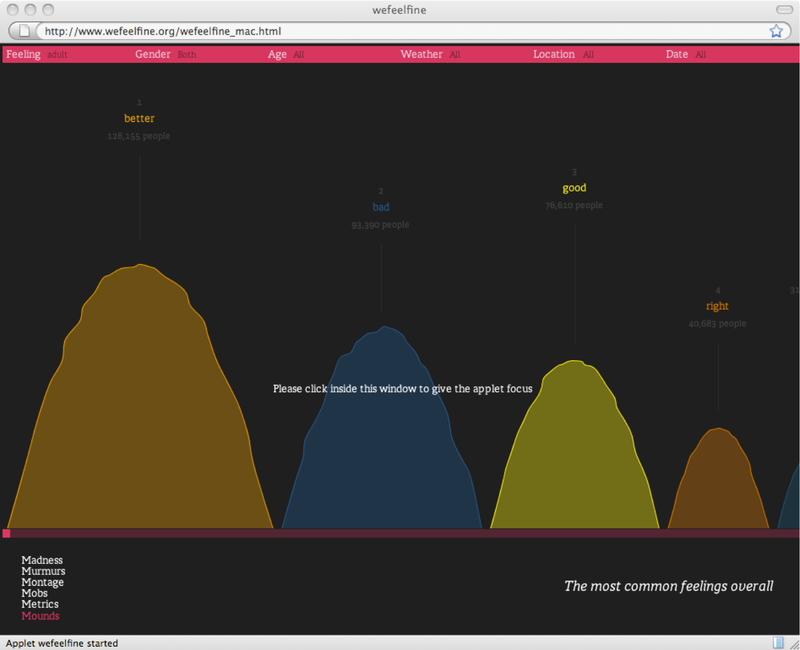 This section focusses on sentiment summarization via visualization. While there is work on textual sentiment summarization, I think high-level visual summaries are better in this area. Any linguistic summary will leave out important nuances of the original source texts, which could be misleading. Of course, visual summaries can make such mistakes too, but we expect them to be high-level and approximate, so we are less likely to be misled. It's often the case that a visualization can capture nuances in the data that numerical or linguistic summaries cannot easily capture. Figure fig:tufte is a famous example involving datasets that might be summarized in the same way but nonetheless have very different properties. 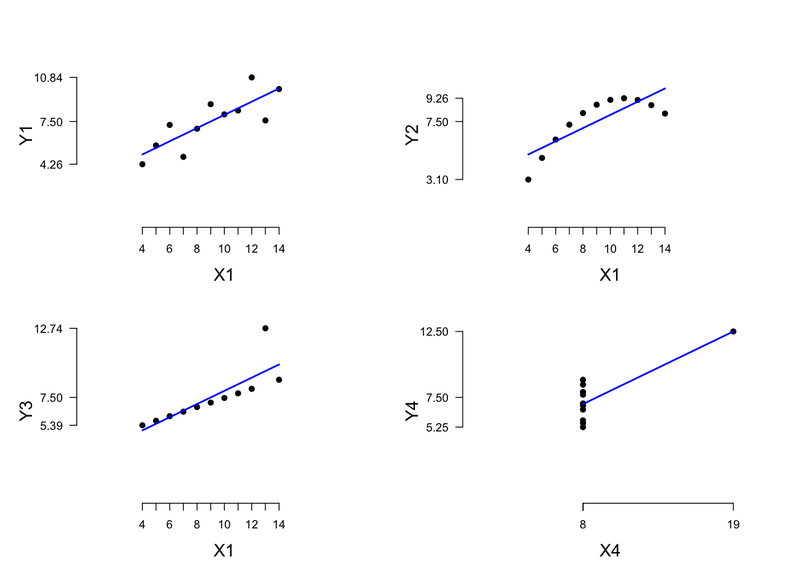 Anscombe’s Quartet (Anscombe 1973), via Tufte (2001): four dramatically different data-sets with the same mean (7.50), standard deviation (2.03), and least-squares fit (3 + 0.5x). Draw attention to the data, not the visualization. Use a minimum of ink. Proportion judgments: highest accuracy with side-by-side bar charts (Cleveland and McGill 1984; Heer and Bostock 2010). For Web-based displays: gridlines improve accuracy; for a 0-100 scale, at least 80 pixels (no evidence that increasing height beyond that helps; Heer and Bostock 2010). The online interface to SentiWordNet uses colored triangles to place words in a space defined by positive, negative, and neutral sentiment (figure fig:sentiwordnet). Twitter Sentiment uses Google Charts to summarize its search results, and it also provides the raw data so that users can probe more deeply (figure fig:twittersentiment). 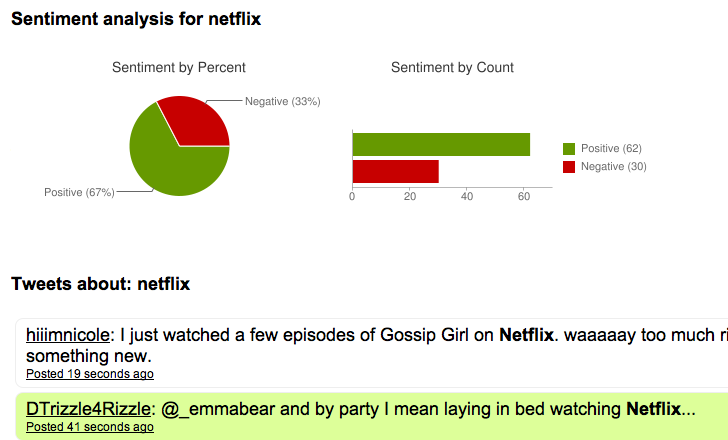 Twitter Sentiment results for Netflix. Twitrratr blends the data and summarization together (figure fig:twittrratr). We Feel Fine aggregates enormous amounts of data and then visualizes the results for strings of the form we feel X (figure fig:wefeelfine). 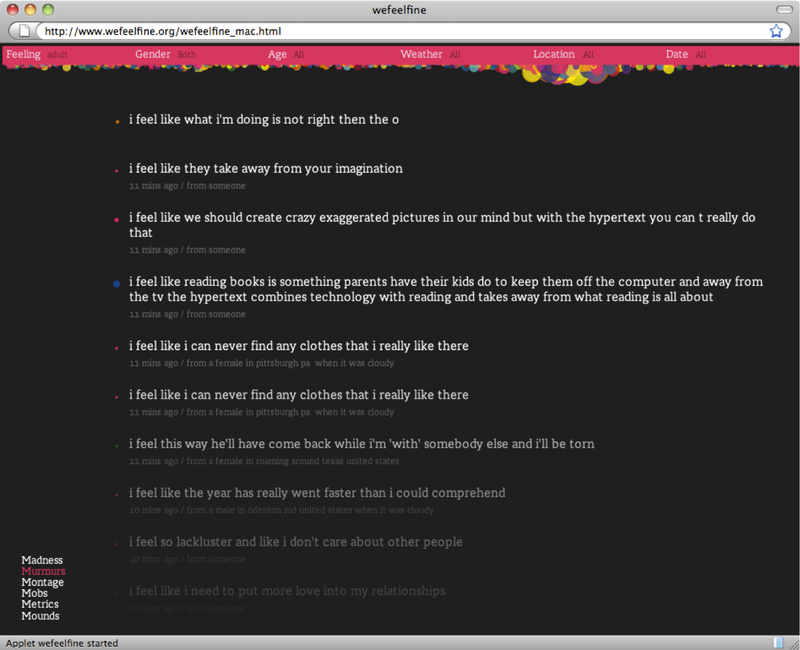 Visualizations from We Feel Fine. Figure fig:ep2d uses the t-SNE algorithm to embed a very high dimensional lexicon into a 2d space. A 2d embedding of a lexicon derived from Experience Project data using an extension of the model from Maas, Daly, Pham, Huang, Ng and Potts 2010. 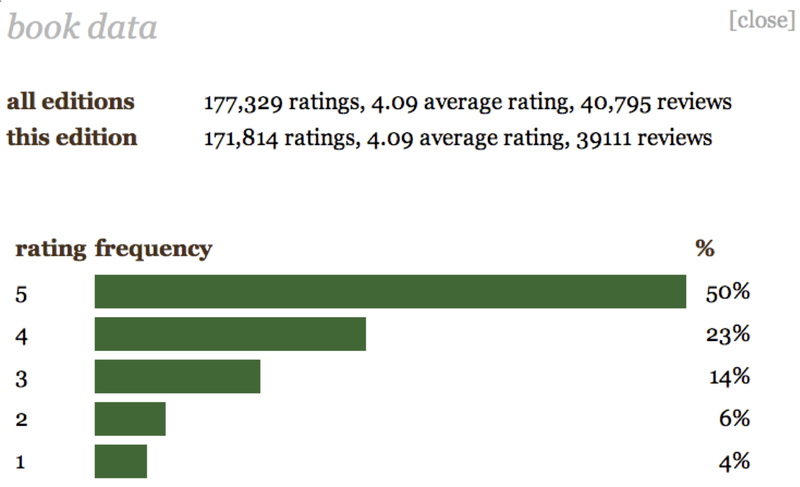 Figure fig:imdbep visualizes scores derived from the IMDB and Experience Project websites using the methods described in the lexicons section. Merged IMDB and EP lexicons. The x-axis represents attenuation and emphasis. The y-axis represents sentiment polarity. 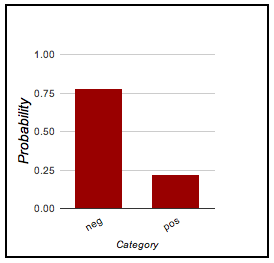 The colors represent the (largely orthogonal) Experience Project scores. Figure fig:gephi uses the Gephi social networking program to graph the relationships between modifiers in WordNet as given by the similar-to graph. 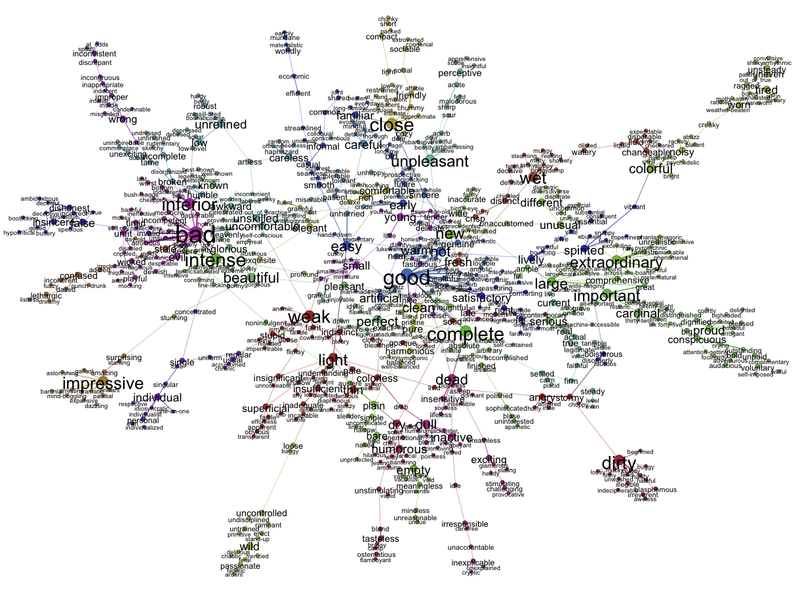 WordNet modifier relationships visualized using Gephi. Many online retailers and social networking sites do an excellent job of summarizing rating information about specific products and services. I think the summaries in figure fig:ratingsum work particularly well. 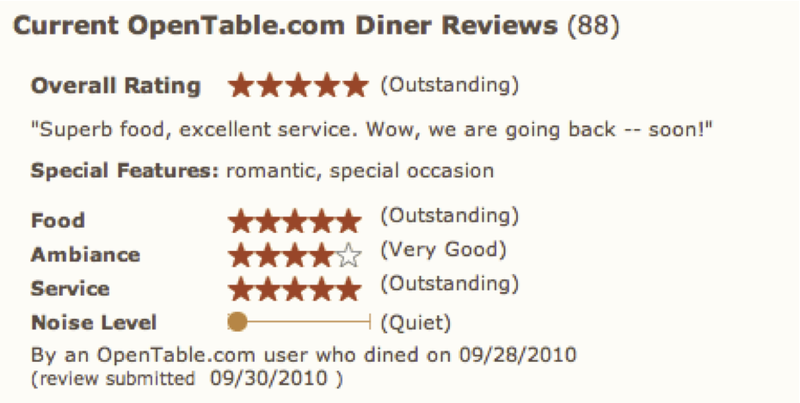 Effective rating summaries of products and services. If you build a classifier model, I think it makes sense to provide similar distributional information, so that it is apparent not only what predictions your system makes but also where it is particularly certain or uncertain. 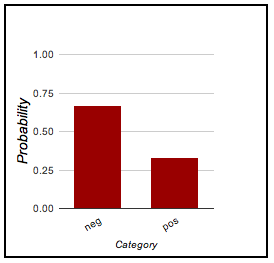 Figure fig:predict provides some examples from the classifier demo. Classifier predictions. 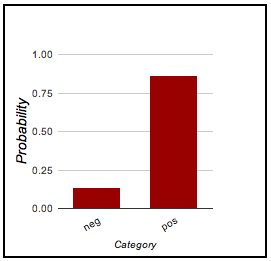 The rightmost case is unclear, and this is reflected in the relatively slim margin by which neg wins our over pos, as compared with the more certain judgments of the other short reviews. This movie was terrible! This movie was amazing! This movie was okay but a bit too long. 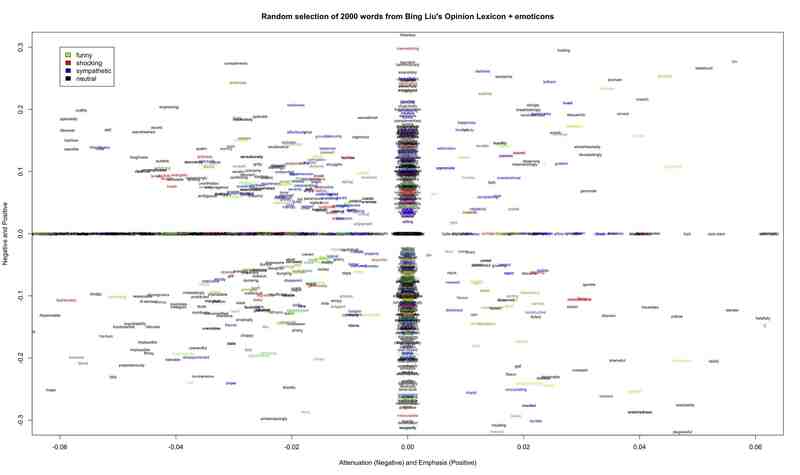 Bing Liu often uses boxplot-like visualizations to compare products along a variety of dimensions. 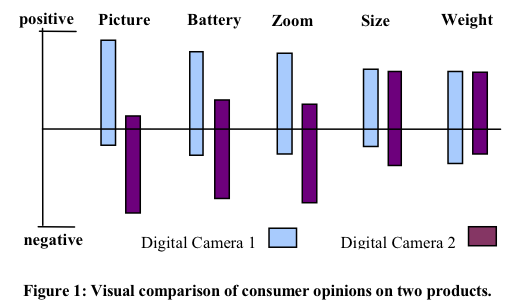 In figure fig:liu, this is particularly valuable, since reducing the comparison to a single number might be misleading, as each product has its own strengths and weaknesses (which individual users might care about at different levels). Comparing two products along multiple dimensions (Liu, Hu, and Cheng 2005). Finally, Wordle graphics are extremely popular these days. They usually represent the words in a text, with size corresponding to frequency (and the colors often randomly assigned). 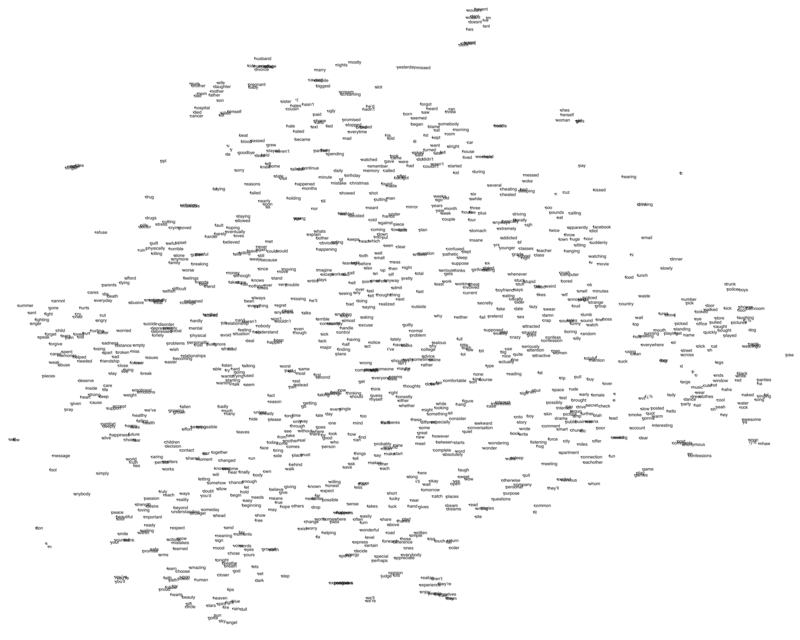 Figure fig:wordle does something slightly different: it visualizes a text as a cloud of semantic classes from the Harvard General Inquirer (left) and LIWC (right). Wordle-like visualizations of a text from the Experience Project. At left, the text is reduced to its Harvard General Inquirer classes, with the size of a class name given by the number of words from the text in that class. At right is the same kind of visualization using LIWC semantic classes. Visualization is often the best way to summarize sentiment information. Colors and shapes can provide a quick mental framework for sentiment analysis. Dimensionality reduction is generally very important, but it should be done with caution. Favor visualizations that convey the degree of certainty you have in your conclusions. Try to make the raw data supporting your conclusions easily accessible, so that users can drill down to gain a better understanding.